So, you’re one of the 10,000 baby boomers who hit age 62 today. And you realize that your 62nd birthday is truly special. 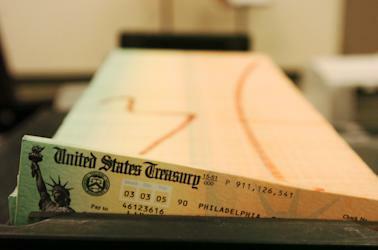 It’s the age at which you can finally start collecting your Social Security retirement benefits! Year after working year, you’ve seen 6.2 percent of your pay deducted from your paycheck in Social Security taxes. Your employer has kicked in the same amount – money she’d otherwise have paid you. It’s Social Security payback time! It’s time to start collecting! You’ve heard that the longer you wait to collect, the larger will be your monthly check – in fact, up to 76 percent larger if you wait till 70. But waiting that long can’t make sense, can it? What if you die before age 70? You’ll have gotten nothing back for all those employee and employer FICA taxes. On the other hand, if you die, you’ll be in heaven. Heaven is heaven, right? You’re not going to be kicking yourself up there for missing a few Social Security checks. Since dying is heaven, the real risk isn’t dying without getting paid back. The real risk is living, specifically outliving your money. From that perspective, waiting a few years to collect a much higher monthly Social Security check right through your maximum age of life may make sense. Maximum age of life, by the way, is not the same as expected age of life. Maximum age of life references the oldest age to which you could live. And you need to plan to live to your maximum age because, well, you might. The Social Security benefits you give up by waiting effectively represents a premium for an insurance contract – a higher benefit that continues if things turn out really badly, namely you stay alive! But buying a higher Social Security annuity to protect you for years after you will, absolutely for sure, be entirely dead makes no sense. That’s like insuring your car after you’ve sold it. Consequently, the general rule about taking Social Security is there is no general rule. It depends on your maximum age of life and other factors, including whether you have other financial resources to spend while you wait to collect Social Security. Moreover, if you are married, divorced, but were married for at least ten years, or are widowed and were married for at least nine months, you’ll be eligible for spousal and survivor benefits. If you play your cards right, you can take your retirement benefit without wiping out or reducing the other benefit, at least for a number of years. And playing your cards right can mean big bucks. Let me illustrate with one of my company’s personal finance software programs called Maximize My Social Security (www.maximizemysocialsecurity.com). Joe and Nicole just turned 62. They’re in good health, and figure they might make it to age 100. They both started work right after college, earning $30,000 each. Their earnings grew at 3 percent per year, so they each made $95,000 last year when they retired. Both Joe and Nicole are considering taking their retirement benefits immediately. If they do so, they’ll each collect $1,825 per month (adjusted annually for inflation). And their combined lifetime benefits (measured as total annual real benefits through age 100 valued in the present using a 2 percent discount rate) will equal $1,209,764. But in taking their retirement benefits early, Joe and Nicole not only get a smaller monthly check. They also are automatically deemed by Social Security to be applying for their spousal benefits. And since their own retirement benefit exceeds their spousal benefit, they collect no spousal benefits. Next suppose they both wait until age 70 to collect their retirement benefits. This raises their monthly check to $3,194 each. And their lifetime benefits rise to $1,549,830. That’s a $340,066 increase! How about spousal benefits? Same deal as before. If they apply for spousal benefits at 70, neither will qualify because their own retirement benefits are higher than their spousal benefits. The trick for Nicole and Steve to get spousal benefits is to do so after reaching full retirement age, at which point Social Security’s deeming provision no longer applies, but before collecting retirement benefits, at which point the retirement benefit wipes out the spousal benefit. In fact, Joe and Nicole can raise their lifetime benefits another $59,266 to $1,609,096 by having a) one of the two of them, say Joe, file for his retirement benefit at full retirement age (66 in this case), but suspend its collection, b) Nicole file at full retirement age only for a spousal benefit on Joe’s earnings record, c) Joe restart his retirement benefit at 70, and d) Nicole start her retirement benefit at age 70. Under this file and suspend strategy, Nicole can collect, as a spousal benefit, half of Joe’s full retirement benefit for four years with no impact whatsoever on her own age-70 retirement benefit, i.e. Nicole will get what amounts to free spousal benefits! Unfortunately, unless Nicole and Joe get divorced, they can’t both collect a free spousal benefit. When Steve files and suspends, he’s treated as if he’s collecting a retirement benefit by Social Security and that phantom retirement benefit wipes out his spousal benefit. Now consider how things differ if Joe and Nicole set their maximum ages of life to 80. In this case, one of them, say Joe, should start taking retirement benefits at 65 and Nicole should take her spousal benefit at 66 and then wait until 70 to collect her retirement benefit. By taking his retirement benefit early, Joe permits Nicole to get a free spousal benefit, but also adjusts his benefit collection strategy in light of his much shorter maximum lifespan. Social Security’s rules are horribly complex. So is thinking through your optimal strategy even if you understand the rules. This is why we developed our software tool -- to help people sort out their best Social Security strategy before they make very costly mistakes. Laurence Kotlikoff is an economist at Boston University and President of Economic Security Planning, Inc. (www.esplanner.com), a company that specializes in personal financial planning software.